Luxury brand consultant Alice Ryan creates a refined country dwelling now on the market for the next lucky owner. Pale floors and walls create a fresh canvas for vintage and antique furnishings. 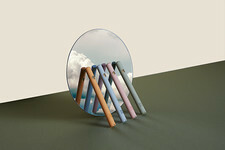 The Cisco Home sofas are covered in Sunbrella fabric for durability. Bucolic is the word for the North Fork of New York’s Long Island, where mom-and-pop vineyards and organic farm stands stretch out for acres across the horizon. Even in the off-season, the feeling of summer lingers: a mood of airiness and ease that casts an immediate, almost palpable spell. It’s a sensibility that has specific resonance for Alice Ryan, an English transplant and high-powered publicist with deep connections in the fashion and lifestyle worlds. (Her clients have included Jimmy Choo, Jo Malone, and Valentino). She and her husband, bespoke menswear designer Kirk Miller, set out to explore the area on a whim inspired by friends of theirs, Christopher and Amanda Brooks, who owned property nearby. The 1901 clapboard farmhouse is set on almost four acres. Alice Ryan and Kirk Miller with daughter Elliott Grace and son Grey. As real estate stories go, this one possesses more than its share of enchantment. 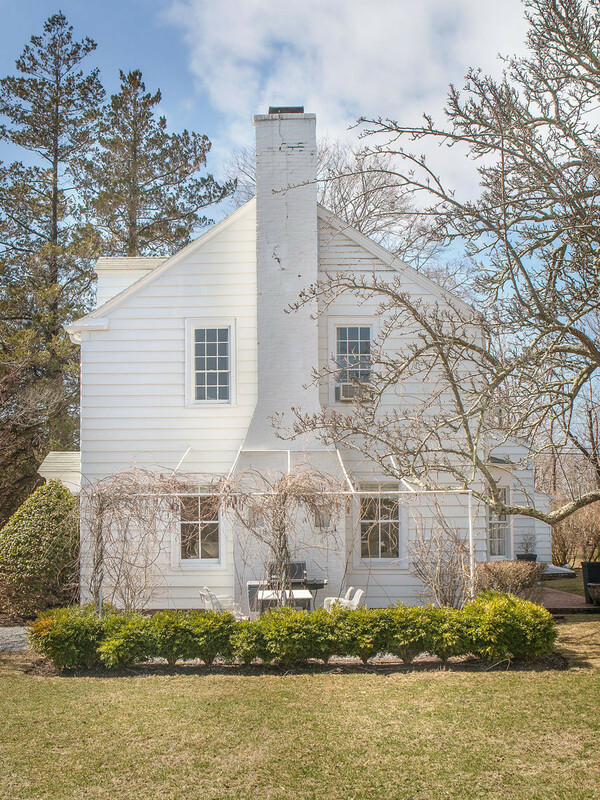 In the role of Sleeping Beauty: a 1901 clapboard farmhouse surrounded by almost four acres of grounds in the town of Southold. “We drove past and I said to Kirk, ‘That’s my dream home,’” Ryan says—then put it out of her mind when she heard it had just been sold. Little did she know that the woman who had lived in the house for more than 50 years had come close to selling several times, only to get cold feet. When Ryan and Miller found out the property was back on the market, they sped over to take a look. As they pulled into the driveway, Ryan—newly pregnant at the time with the couple’s now-seven-year-old son, Grey—jumped out of the convertible and did a dance of joy. 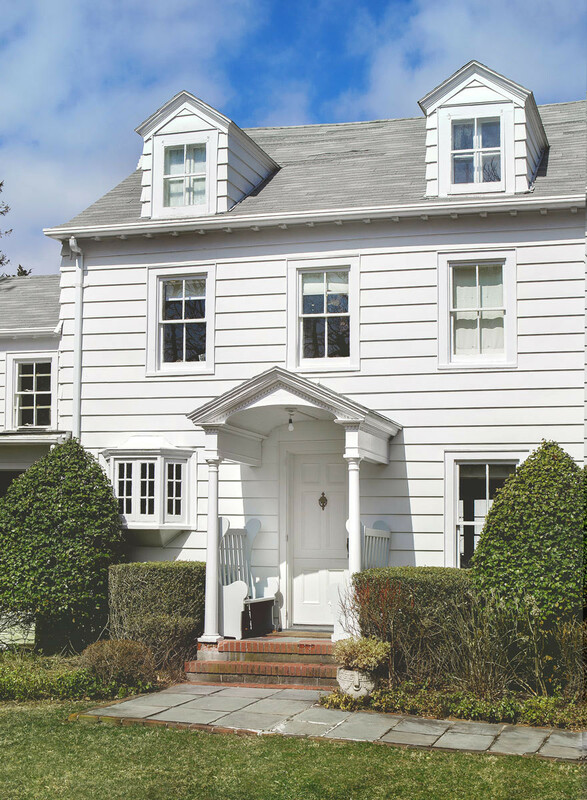 Blessed with copious windows, the home emphasizes its airy mood with walls painted in Benjamin Moore's Timid White. Fortunately for the young couple, their offer was accepted—and this time, the sale went through. When it came to the interiors, Ryan initially kept it simple and took the valued advice of a trusted friend. 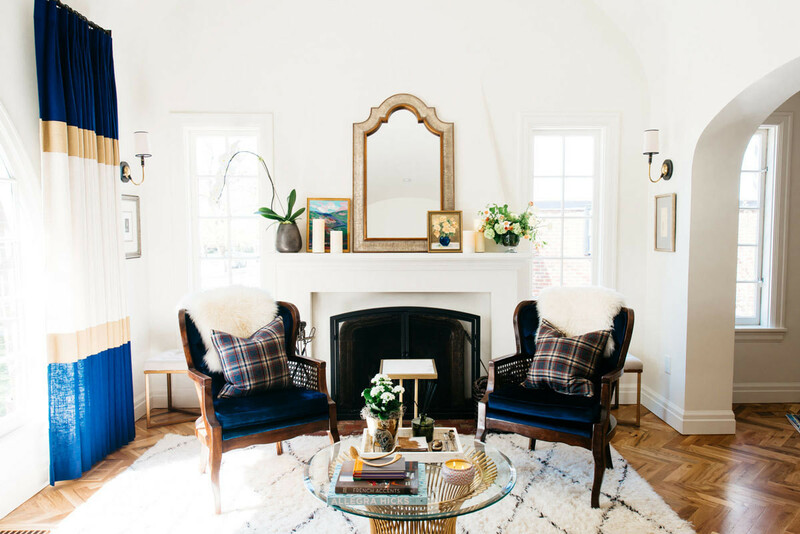 “[Designer expert] Tom Delavan suggested that creating a consistent canvas would be a great way to get to know the house and how the light would unfold over time. So we painted everything a single color—Timid White, by Benjamin Moore—and that’s how we lived for the first six years.” She commissioned drapery and upholstery from the mother-daughter team of Artful Windows in Southampton, using English fabrics from Cowtan & Tout. 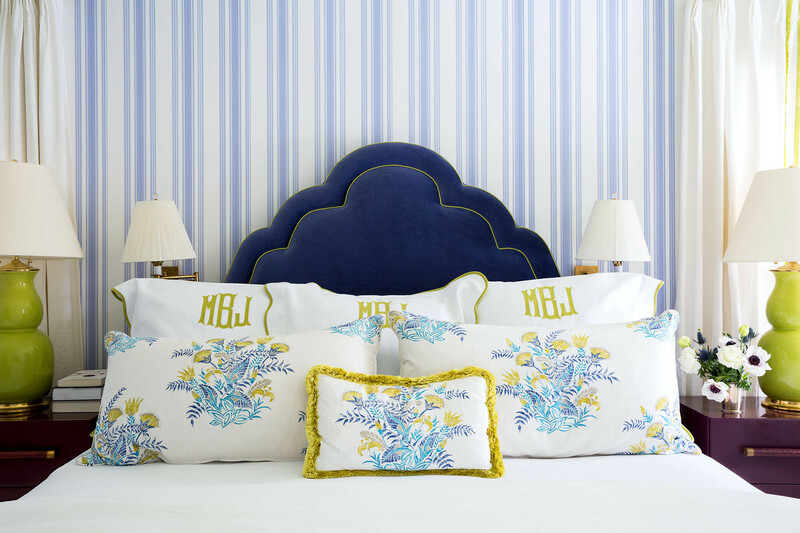 Almost all of her furnishings came from the antiques shop Beale & Bell in the nearby town of Greenport. “It didn’t require incredible investment. The light streaming through the windows, that North Fork glow, was so remarkable that we didn’t feel the need to create something overly precious,” Ryan says. 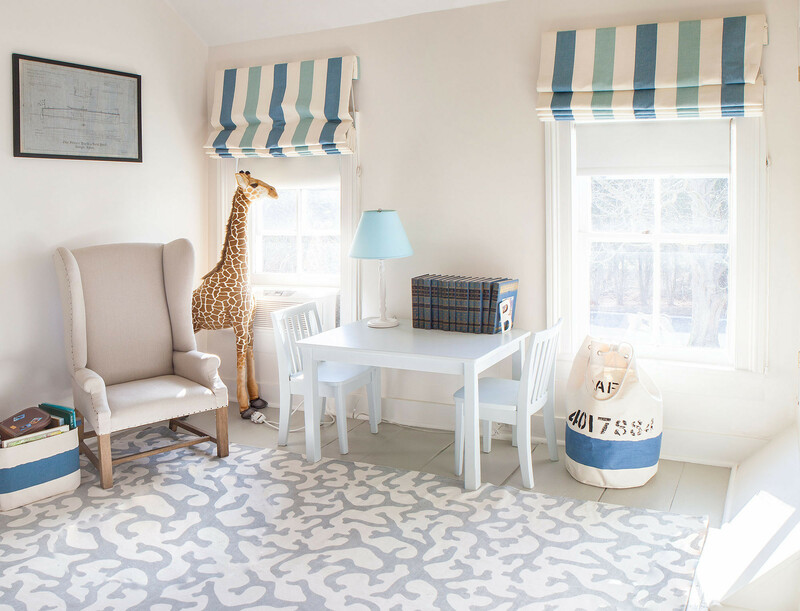 The nursery's gray and blue color scheme is both child-friendly and stylish. Global textiles, rich wood furnishings, and handsome works of art are showcased throughout the interiors. 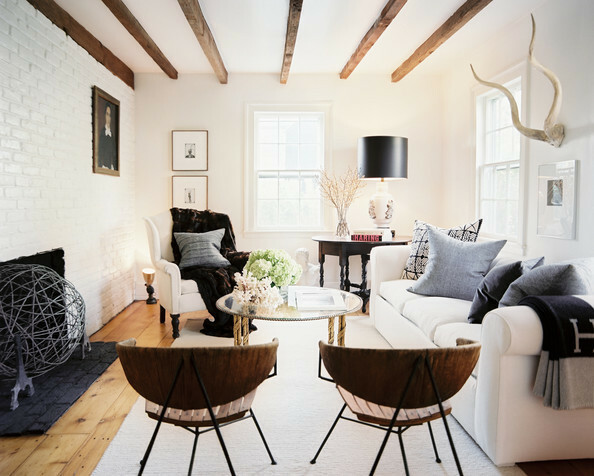 The primary challenge lay in figuring out how to stay true to the home’s character while adapting to a contemporary lifestyle. “I don’t make things easy for myself when I put historical authenticity and the functional needs of a young family on the same level,” says Wiggins-Marin. “But there is simply no other way to create great design.” Rather than opening the wall between kitchen and dining room completely—“doing so would compromise the integrity of the house and risk suburbanizing the entire property,” says the designer—the decision was made to modernize in other ways. The door opening was widened to a generous six feet to allow light and flow between the two separate spaces. The ceiling was raised and the original interior beams left exposed. A bank of four windows was installed above a farmhouse sink, providing views across the peony garden and to the property’s whitewashed barn. 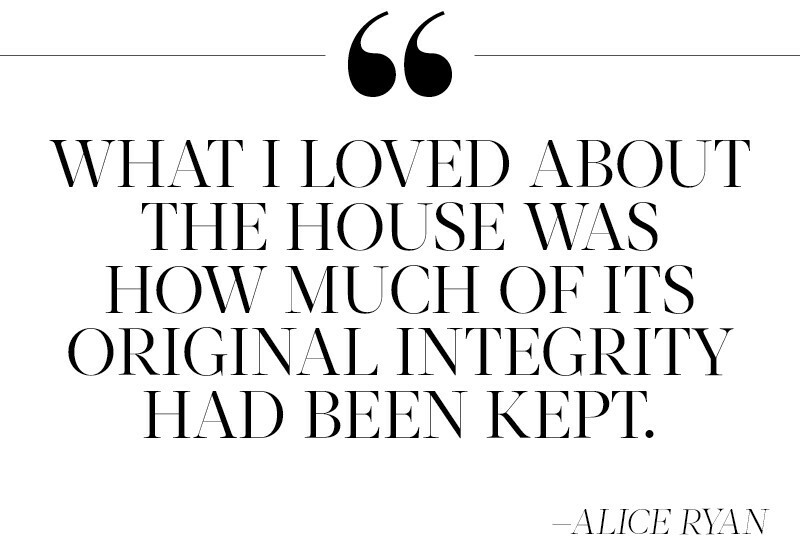 “I love the old and the antique, obviously. 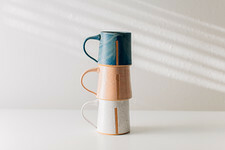 But I also love a tight color palette and a minimalist approach, and the juxtaposition that is created when traditional shapes and styles are seen through this lens,” says Wiggins-Marin. Muted pale tones on floors and walls allow the patina of the rich wood furnishings to shine. 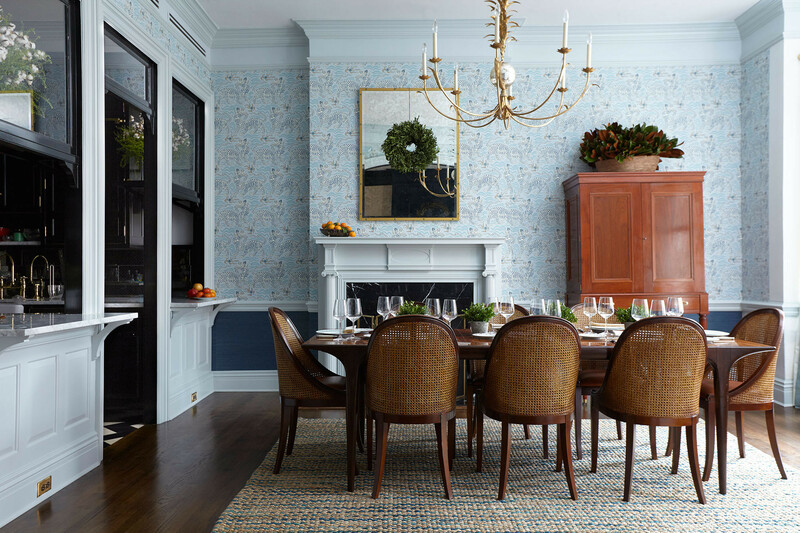 A round dining table with considerable heft contrasts handsomely with a set of Bertoia wire chairs. 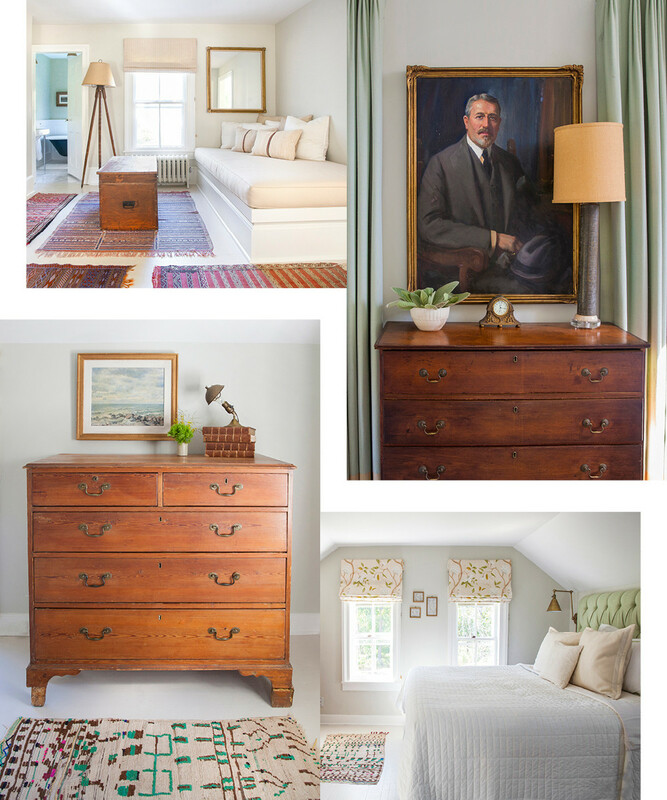 In another room, antique Turkish textile pillows and an English oil painting share the space with 19th-century Berber rugs and a colonial American trunk. 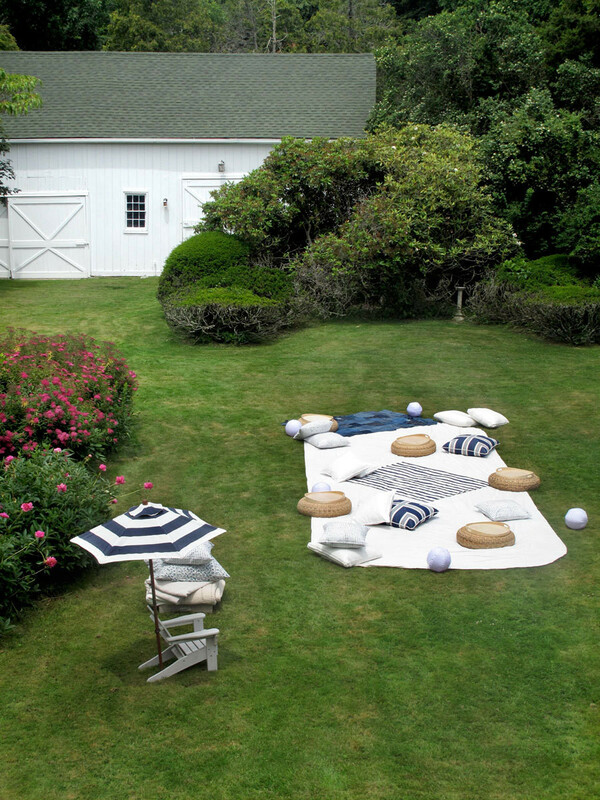 An alfresco scene in high summer. The house during the quiet autumn season. 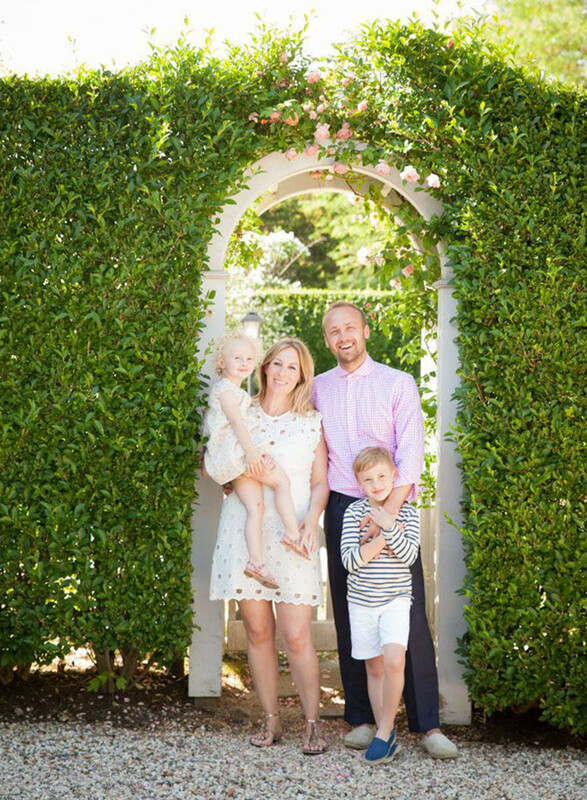 With two more children in the mix, three-year-old Elliott Grace and baby Barnes, Ryan and Miller were mindful to keep interiors, in their words, “un-precious.” The living room’s Cisco Home sofas are covered in Sunbrella fabric; tables and chairs are constantly moved outdoors for afternoon tea parties. “It was always my desire to use everything from the china to the Irish linen, whatever it might be—every piece of furniture,” says Ryan. “There isn’t anything about the house that remains off-limits.” Now, after a cross-country move to Southern California, Ryan and Miller have put their North Fork summer home on the market. “It’s a house with a great heart and a great history,” says Ryan—and, like all good fairytales, it’s destined for its own happy ending. FOR INQUIRIES ABOUT THE HOUSE: ryanmillerhouse@gmail.com. 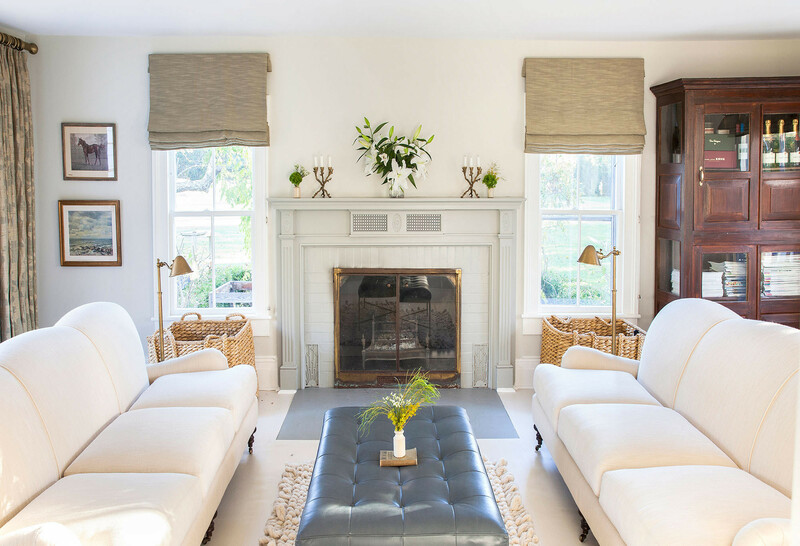 The designer creates a stunning retreat filled with soothing prints and timeless style. See how the up-and-coming designer infused a historic seafaring hideaway with shimmering 21st-century style. One Salt Lake City, Utah, couple turned a run-down house into their dream home.